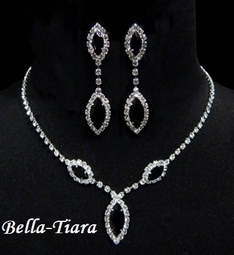 Sparkling Triple Navette Drop Necklace and Earring Set with Black Crystals. Measurements: The necklace is adjustable from approximately 16" - 19" long. The earrings are approximately 1.5" tall. PURCHASE 6 OR MORE PIECES AND RECEIVE 15% DISCOUNT. USE CODE JEWEL15 AT CHECKOUT.